Image Courtesy Chicago ‘Star Wars’ Celebration. The Chicago Star Wars Celebration is fast approaching and fans of the series won’t want to miss the amazing fan props and sets, talented actors, and exhibitors! The voices behind your favorite animated Star Wars series characters were added to the guest list. Attendees include Star Wars Resistance actors Christopher Sean (voice of Kazuda Xiono), Suzie McGrath (voice of Tam Ryvora), and Scott Lawrence (voice of Jarek Yeager); Star Wars: The Clone Wars characters James Arnold Taylor (voice of Obi-Wan Kenobi), Matthew Wood (voice of General Grievous); and Star Wars: Battlefront II actress Janina Gavankar (voice of Iden Versio). 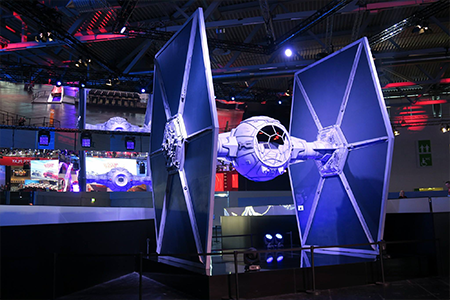 The celebration will feature iconic sets and props from the Star Wars universe built by some of the most talented fans from around the world. Props will include the TIE Fighter, X-wing Fighter, Tantive IV Corridor and a Rogue One Tank. TIE Fighter. Image Courtesy Chicago ‘Star Wars’ Celebration. There is still time to buy your tickets and experience everything the celebration has to offer. Monday adult and kids tickets are still available. The Chicago Star Wars Celebration takes place at McCormick Place on April 11-15. “All That” Reunion Coming to The Splat in April! Rob Benedict and Rich Speight, Jr.’s Instagram Takeover!